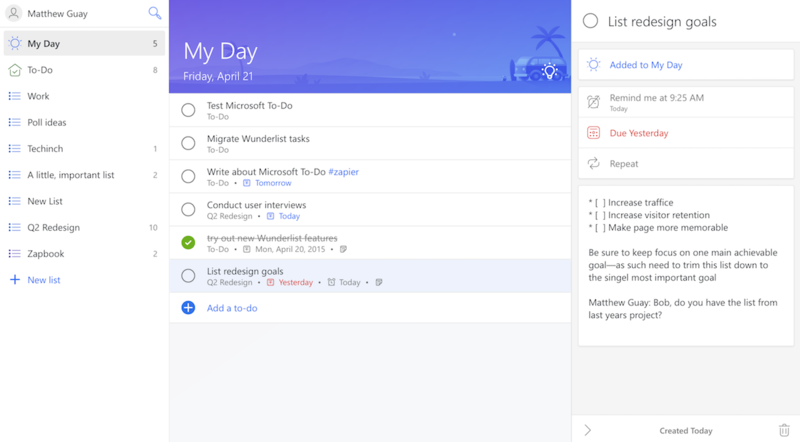 Just under two years after acquiring Wunderlist, Microsoft has reinvented the to-do list with their simply named new tool: Microsoft To-Do. It's the core Wunderlist features in a simplified design that, indeed, focuses just on your to-dos. Its best feature is just barely hidden below the surface: Suggested tasks. Instead of showing the tasks due today in your Today list, it starts each day out with a blank list so you can plan your work. The lightbulb icon on that page then offers suggested tasks—ones the app thinks you might want to work on today, along with those that are due or overdue. Either way, you have to plan out your day manually—and that can be really helpful. I personally write down a list of the most important tasks on paper each day, to job my memory and keep focused despite what my inbox says. Microsoft To-Do has built that idea into an app. It's not nearly feature-complete compared to Wunderlist, but it's a neat start—one that'll be interesting to watch mature. Here's all the details you need about Microsoft To-Do—including a hidden feature to organize your task lists with emoji.